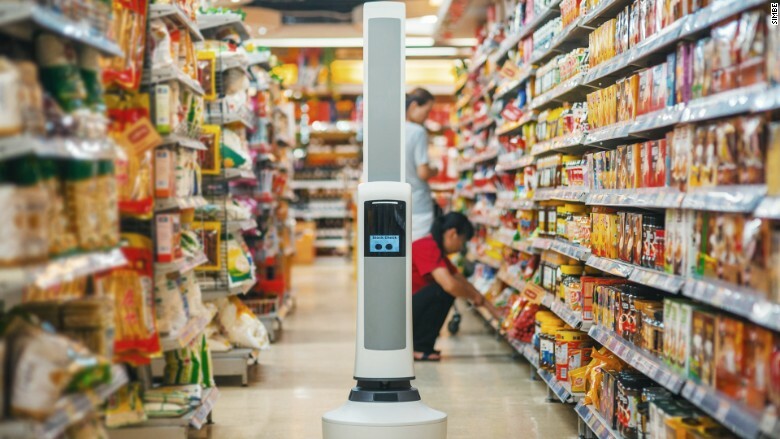 The Tally robot roams the aisles of retail stores and tracks inventory. There is a robot on aisle 4. Tall and skinny, with round blinking eyes designed to make it seem friendly, Tally is a new kind of retail worker. It is an inventory-tracking robot, able to tell when a store shelf is running low on tomato soup, or if a rogue can of tuna has ended up in the wrong spot. Tally is the first product from Simbe Robotics, a small startup making robots for the retail industry. Its goal is to create robots that will tackle "dull, dirty, mundane tasks 10 times better than their human counterparts," according to CEO and co-founder Brad Bogolea. Retail stores typically have human employees who roam the floors, manually taking inventory with handled devices. In a mid-sized store like a Walgreens, there are between 10,000 and 20,000 products for sale. Bogolea says it takes an employee 20 to 30 hours a week to audit all those items. One Tally robot can scan 15,000 items in an hour. Completely autonomous, Tally moves four feet at a time before pausing to take high-resolution photographs of everything on store shelves. It tags the images with metadata, like an exact location, and uploads them to the cloud. The system then matches those images against a store's files of what exactly that shelf should look like and instantly creates reports. If Tally sees the cereal aisle is low on Cheerios, an employee can quickly restock that shelf. Inventory issues are a huge financial drain on retail stores. Out of stock items cost retailers nearly $500 billion a year, according to one study by the IHL Group. If a customer can not find the product they are looking for, they might choose a competing brand, or go to a different store. Another obvious cost savings of robots is on labor costs. Bogolea is careful not to say Tally replaces any human's job. Instead, he says it frees up resources to focus on customer service, one of the last big advantages brick and mortar stores have over commerce options. Simbe hopes to make more retail robots. Started in 2014 by a group of former employees from Willow Garage, a well known Silicon Valley robotics lab, Simbe has raised an undisclosed amount of money from Lemnos Labs and SOSV. So far, Tally has been tested in the wild at one big-name store, though Bogolea would not say which. The company hopes to get it into fast-moving goods retailers like Target, Walmart and CVS. It is not disclosing the price of the Tally system at this time. One of the biggest challenges these types of robots will face is curious people. It is still rare for an autonomous robot to mingle with consumers. Tally has a number of safeguards to help it co-exist with shoppers. It includes a number of sensors, similar to those used on self-driving cars, to avoid collisions. An internal measurement unit can detect any unusual activity. Like someone picking up the 30-pound robot and making a run for the door.